The following investigation was prompted by research into the springs and wells linked with the Purlieu Brook, near the Wyche Cutting on the Malvern Hills. 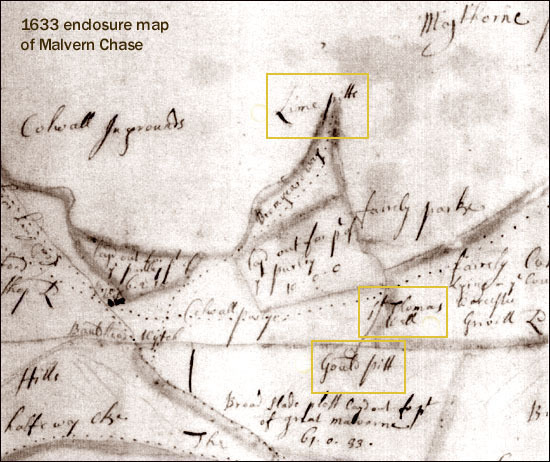 The 1633 enclosure map of Malvern Chase shows a spring rising at 'The Gould Pitt' (now known as The Gold Mine, 350m north of the Wyche Cutting), and its stream running west past St Thomas's Well, where the Royal Malvern brewery and bottling works was later built, and down the Purlieu. 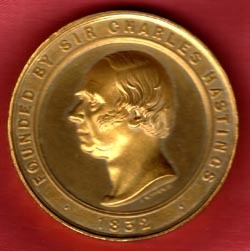 The above is the earliest documentary evidence of gold mining in the Malverns that this author has so far come across. 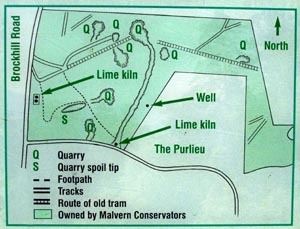 Map above - the 1633 enclosure map showing the Lime Pitts at the lower end of the Purlieu, St Thomas's Well, where later the West Malvern Spa would be built and the Gould Pitt; the map is orientated with west at the top, north to the right. Between 1711 and 1721, a William Williams of Bristol and a Doctor Dudley spent 600 pounds initially working from a level or horizontal passage of 240 feet and then sinking a deep shaft of 220 feet to find metallic ores in the Malvern Hills. A detailed account of this adventure appears in Chambers J "A General History of Malvern" (1817) Ch.VIII. In the account it refers to local people calling the scales of mica "gold dust", also the bronze lustre of micareous substance within the rocks being called "cat gold" in the Malvern hills. 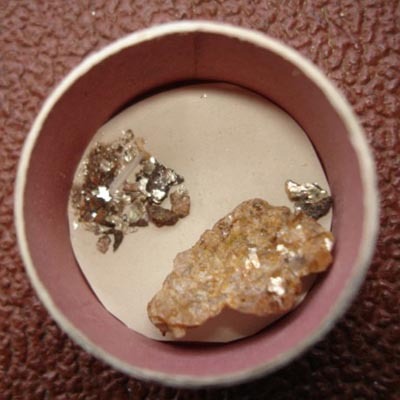 To read this account in full, click on Chambers Mineralogy left. 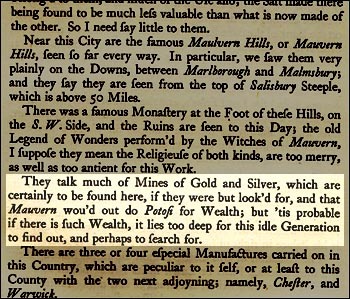 Daniel Defoe between 1724-7 had noted a gold mine a little north of the Wyche cutting, by then abandoned. 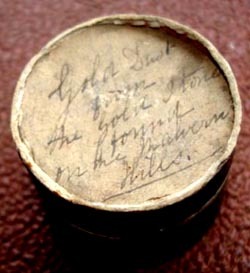 He commented 'they talk much of Mines of Gold and Silver, which are certainly to be found here....' He observed that if there was such wealth it was likely 'it lies too deep for this idle generation to find'. Were these early prospectors deceived by the glittering mica in the rocks? The belief of gold in the Malvern Hills was supposedly disproved in the 19th century; albeit the rumour of gold being found in small quantities perpetuates. It is indeed, but a few years ago, so complete was the ignorance of persons upon these subjects, that a shaft was sunk to raise gold from the hills of Malvern, and the individuals concerned lost a large property in speculation. Now the story has a 21st century twist. In our exploration of the springs and wells for Celebrated Springs of the Malvern Hills we noted what is generally described as a "well" shaft in the woods on the northern side of the Purlieu. The sequencing picture above shows the shaft near the Limekilns. The logic for digging a well at this point does not stand up to scrutiny because there is much more easily obtainable water nearby. Comparison with other similar sites elsewhere suggests that the shaft is possibly an old mine, with the once buried covering now rotted and collapsed. The working quarry face for the limestone is nearby and the shaft may well have been rediscovered as the face moved west. It was then covered in timber and other materials of more recent origin and buried beneath the spoil that the quarry workers threw behind them as the face advanced. The Malvern Hills Conservators map showing the "Well" is reproduced right. The proximity to the legendary gold workings prompts the hypothesis that this may be a shaft down to the 18th century gold mine. This idea is supported by gold mining practice of that time. Following an assay to determine whether a mine might be profitable, it was practice to first dig a shaft, into which were installed pumps, ladders and a lifting gear. From the lower part of the shaft, a horizontal drift or level might be dug and at a suitable spot a further shaft sunk from the level to reach deeper deposits. In order to ensure air circulation a second surface shaft was dug down to the drift or level, at the furthest point from the first surface shaft, to provide ventilation. If the two surface shafts were of different height the air circulated freely, as would be the case of the Malvern gold mine. If not a fire would be lit at the foot of one shaft to provide an updraft. 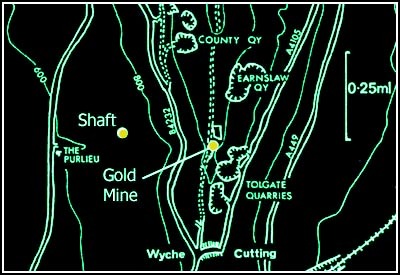 (3) It would appear therefore that what is described as a "well" is possibly a shaft linked to the original gold mine. Alternatively it may have been dug to access limestone beds inaccessible from the surface workings, or linked with an aborted reservoir scheme of the early 20th century. Perhaps an archaeological exploration might be launched to resolve this mystery? The question arises therefore is there winnable gold in the Malvern Hills? The British Geological Survey's MineralsUK, Mineral Reconnaissance Programme report 144 (1997) page 40, identifies alluvial gold in the Malvern Hills suggesting a water eroded higher deposit. A concrete structure in the Purlieu stream near the shaft on the Conservators map above could be interpreted as a settling tank. The Purlieu stream coursed through the structure and alluvial gravel was collected on the floor of the stucture for later separation. There is also the real possibility that the Purlieu stream is fed by a drainage adit from the gold mine as well as St Thomas's Well, or maybe they are now both one and the same? During the days of the gold rushes, both in the United States and in Australia, the last thing you did was tell anyone when you struck gold. Not only did it attract speculative prospectors, it also attracted thieves, rogues and vagabonds all out to cash in on easy pickings, not to mention the opium dens and bordellos. Also in the case of Malvern, the lord of the manor or the Crown may demand the mineral rights dues. Over the last 300 years, was West Malvern on the verge of becoming a gold rush town? Only the dispelling of the belief or perhaps a wall of silence, concerning possible gold deposits prompted future economic activity to be focussed on other commercial enterprises such as Malvern Waters and the Water Cure and of course general stone quarrying. in establishing the credibility of the legend of gold in them thar 'ills. Click Website below for details of "The distribution of gold and silver in the crystaline rocks of the Malvern Hills" (1934) Brammall A., Dowie D L., Imperial College, London.